Next come the tools. 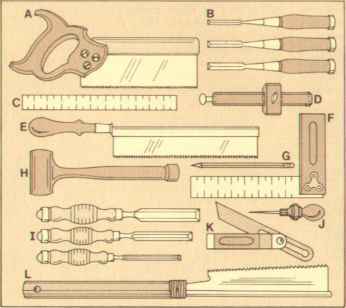 There are actually two sets of tools used in making dovetails. The first group is used to lay out and mark the cuts. The second group is used to do the actual cutting and fitting. lb lay out the cuts for a dovetail you'll need five tools: an adjustable bevel gauge, a small try square, a steel ruler, a marking gauge, and a scribe or a sharp pencil. sliding bevel. Sliding bevels (K in Fig. 1.) are available at almost every hardware store. The 'arm' can be adjusted to any angle and tightened in place with a thumb screw. The sliding bevel is used to make the initial marks for the dovetail . try square. Most of us have a 6" or 8" try square in the shop, (F in Fig. 1.). It's also nice (but not necessary) to have a smaller 3" try square to mark the straight-line cuts on the end and face of the boards. steel ruler. A good 12" steel ruler is almost indispensable in any woodworking shop, (C in Fig. 1). It's much easier (and usually much more accurate) to work with a steel ruler than fumbling with a tape or a wooden folding rule. marking gauge. On page 12 in this issue we've shown the plans for a marking gauge, (D in Pig. 1). We used this one to mark all of the base lines for the dovetails in this issue. If you buy a marking gauge, the point should be reshaped as mentioned on page 12.
scribe vs. pencil. The last item you need is up to some debate. The traditional tool used to mark the cut lines is a sharp-pointed scribe, which is just a lightweight version of an awl, (J in Fig. 1). I prefer a sharp No. 3 pencil, ltd uses a fine-point felt-tip pen. Among traditional woodworkers the mere mention of using a pencil or a pen is enough to make them shiver with disgust. A scribe, they would say, is the only acceptable tool for marking. If you use a scribe, it should be sharpened to a long slender point to mark (scratch) a fine, accurate line. Of course, this line is almost impossible to see, so it may help to sprinkle some pencil-lead dust (for light-colored woods) or white chaulk (for dark woods) in the scratch line. But when you get down to it, the line is only there as a guide for cutting. If I can't see it, it doesn't do much good. So, I prefer to use a sharp No. 3-lead pencil. scratch line of a scribe. In fact these harder pencil leads almost scratch the wood just as a scribe does, yet the hard lead leaves a visible line. The key thing is that the pencil is sharp. Most pencil sharpeners go only so far. After sharpening to get the point, I hone the point on a piece of scratch paper (rubbing and twirling to sharpen the point).